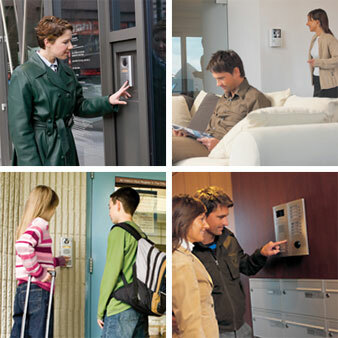 Are you looking for a security solution to screen and communicate with visitors at your door? Or a better security system for your apartment or office building? The door phone intercom might be just what you’re looking for. A door phone intercom allows the user to find out who is at the door without having to physically open it. The visitor pushes the door phone button, the connected phone rings with an identifiable tone. Some systems provide a camera so you can also see who is at the door, and audio communication is often allowed. This is an ideal solution for a family in securing the safety of their children at home. They will not be opening the door to random strangers. Some door phone intercom systems allow for opening the door remotely. This can be done through a door release button or remote control device at the master station. There are also door phone intercom models that can be incorporated with the latest IP phone system technology. If you are seeking the latest modern features, you’ll want to investigate the Valcom VIP 170 IP HandsFree Talkback Intercom. This system has expanded features including automatic talkback VOX operation, companion to IP CCTV cameras, door ajar notification, door and gate relay. The system is compatible with Nortel, Cisco, Avaya and most modern IP telephone systems. It is weather resistant, tamper and vandal proof. A door phone intercom system may be the best value available for those who are looking for great security features at the right price.